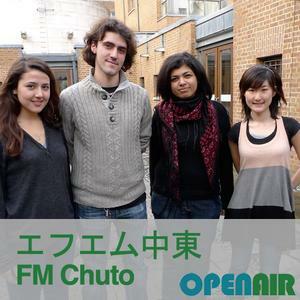 OpenAir Radio’s only speech programme in Japanese, エフエム中東 (FM Chuto (Middle East in Japanese language)) brings the Middle Eastern affairs not just for the English speaking audience but for Japanese audiences outside the UK with Japanese voice over. Presenter Yuki Terada brings you coverage on the Middle Eastern affairs. From Tokyo but now based in London, Yuki addresses Middle Eastern issues which aren't easily accessible in modern Japan. Past interviewees include Professor Charles Tripp from the School of Oriental and African Studies. Part 2 of Marina Khatibi's interview with Mrs Sorour Dundon, lecturer of Farsi and the organizer of the Norouz (Persian New Year) Celebration in SOAS. FM Chuto interviews Rana Salam, designer and the co-author of the book, "The Secret Life of Syrian Lingerie - Intimacy and Design". She talks about the unique design of Syrian lingerie from the view point of a designer and expert in the Middle Eastern Pop culture. Dr. Bhavna Dave, Lecturer in Politics of Central Asia at SOAS, examines Pakistan's identity as a Muslim state. Dr Dave discusses the complex relationships between Islamisation, democratisation, and military regimes with Ryota Sugiyama. Ryota Sugiyama interviews a SOAS law student from Pakistan, who was in Karachi when Benazir Bhutto was assassinated in December 2007. In the interview she explains the social and political situations in Pakistan and what kind of political reform she believes the Pakistani people want. Yuki Terada continues to explore Arab unity in this discussion with Professor Charles Tripp. This episode looks at the origins of Arab unity, including the Arab League and how it acted as both a forum for discussion and a stage for hostilities to play out in the region.